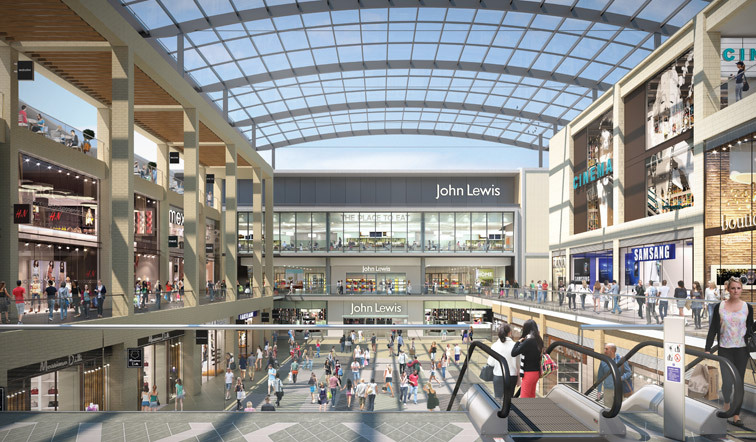 The 74,322m² retail-led mixed-use development in the heart of the Oxford City Centre will have a 13,000m² flagship John Lewis as its anchor department store, 70 new shops, cafes and a five screen cinema, set within a mixture of covered streets, arcades and squares. The scheme will also deliver 59 waterfront homes and a two level basement car park with 1,000 spaces and a large service yard. In late 2014 Oxford City Council granted permission for Westgate Oxford Alliance’s £440m redevelopment of the Westgate Centre. The Alliance is a joint venture between The Crown Estate and Land Securities with Laing O’Rourke acting as the principal contractor. The prime location of this development is in a wonderful historic city along with its bold design, including an elaborate arrangement of tiered specialist designed glazed roofing, 15 slim bridges and roof top restaurants with terraces, which will provide an amazing and unique shopping experience. Waterman was commissioned to provide multi-disciplinary services covering structural, civil engineering, environmental and flood risk services on the Centre, with all the challenges of adjacent historic buildings, World Heritage site lines and traffic diversions to contend with. The scheme itself will be founded on Oxford clay with a tanked basement/service yard, designed to take 600mm depth of flood water. The basement box will also be designed for highway loading with a main bus route cutting through the site. As part of Waterman’s sustainability strategy no pumping will be allowed on the site, requiring part of the enabling works to include a 2m² culvert to divert captured rainwater via a major system of attenuation tanks suspended at ground floor level. The main part of the scheme will be constructed using a composite steel frame with the John Lewis store comprising a combination of in-situ and preset concrete. The residential block is being designed using a Metsec system for the upper levels. The building’s exterior will be clad in mainly brick and stone fronted precast panels. Laing O’Rourke are planning to precast the columns to podium level and the core walls full height using their twin wall system to enable construction manufacturing off site. Despite providing less design lead-in time to manufacture, Waterman has successfully been able to manage the design process to ensure that they will meet the manufacturing and construction programme. As part of the development’s planning consent tight restrictions on head rooms were placed to maintain the views of the Oxford skyline and enable several of the roof top restaurants included in the scheme to take advantage of the panoramic views. Waterman successfully complied with these limitations providing shallow structural design solutions which were developed where necessary to minimise their effect on the overall building zones. Further scheme constraints were presented by the client’s brief to enable the Oxford County Council Library, one of the largest in the UK, to remain in operation at all times whilst the refurbishment programme was in progress. To ensure all works complied, Waterman carefully considered the sequence of all demolition, construction and overall buildability during the works programme. In addition to this the scheme design was master planned by BDP with separate architectural practices on all four building blocks providing a significant co-ordination challenge for Waterman to meet the client’s overall deadlines for the feasibility and scheme design phases on the project. The project was developed via BIM (level 2) using Revit, with the final models to be used for facilities management. Much of the co-ordination and interaction between project teams was exchanged via Revit models. It has proved to be an invaluable help to solve complex areas at meetings whilst also ensuring complete project design co-ordination and time saving will be achieved during the programme. The process will continue throughout the detailed design and construction phases for the project. The project started in January 2015 and is expected to be completed in autumn 2017.